Gansu is a labyrinth of dry deserts, steep mountains, lush valleys and shimmering rivers. For purposes of identification, the Gansu province has been sorted by both its structural formations and topographical features into the Hexi Corridor High Land Plain, the Longnan Hilly Area, the Gannan Plateau, the Longzhong Loess Plateau and the Qilian Mountainous Area. Gansu is well-known for providing China with herbs. Of the 9,500 varieties of medicinal herbs available, the region produces 450. Gansu is multi-ethnic, with approximately 54 different ethnicities living in the area, including the Sala, Hazak, Manchurians, Hui, Donxiang, Tu, Yugu, Tibetan, and Mongolian. Many of these groups have lived in the region for generations already. Of a total population of 26 million, the minority groups take up 2 million. 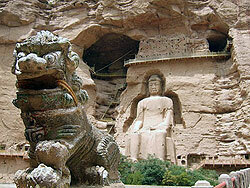 Gansu is the start of the Silk Road, and has several culturally significant sites. Jiayuguan City, for example, is the location of the Jiayuguan Pass of the Great Wall, which was built during the Ming Dynasty, and is currently the most intact pass. The first entrance on the Great Wall’s west end, it was aptly dubbed “The First and Greatest Pass Under Heaven”. Near Dunhuang are the Mogao Grottoes, an amazing area which used to be home to a thousand cave temples. Now fewer than 500 remain. Each grotto contains a large statue of the Buddha, as well as paintings depicting religious scenes and motifs.